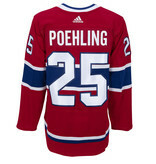 This is the authentic Montreal Canadiens jersey with the name Ryan Poehling #25 heat pressed on the jersey. 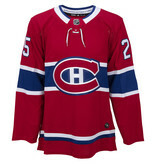 Tricolore Sports, located at the Bell Centre, guarantees the authenticity of this jersey and the lettering used for the personalization. What does heat press personalization mean? This type of high quality lettering has stitching around the letters and numbers and is heat pressed onto the jersey, giving it a clean and official look.